This elegant pocket watch features a double opening half hunter case, mechanical skeleton movement, white dial with roman numerals and matching chain. An elegant timepiece for gentlemen. 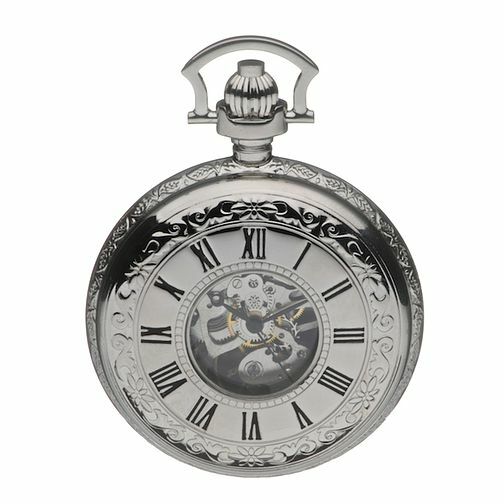 Double Half Opening Hunter Pocket Watch is rated 4.9 out of 5 by 15. Rated 5 out of 5 by Anonymous from Very happy! I bought this as an engagement present for my new fiancé & he loves it! The detailing is beautiful with the skeleton movement & ornate engraving. It also has space on the back for personal engraving, which I had done. It was exactly what I was looking for so I'm very happy, as is my fiancé!